A ribbon cutting was held on Friday, September 30th for Carver Elementary School as they celebrated their new multipurpose room was officially dedicated in memory of Eddie Wright, the late Vance County Board of Commissioners’ member who proved to be the school’s biggest advocate in getting the facility constructed. 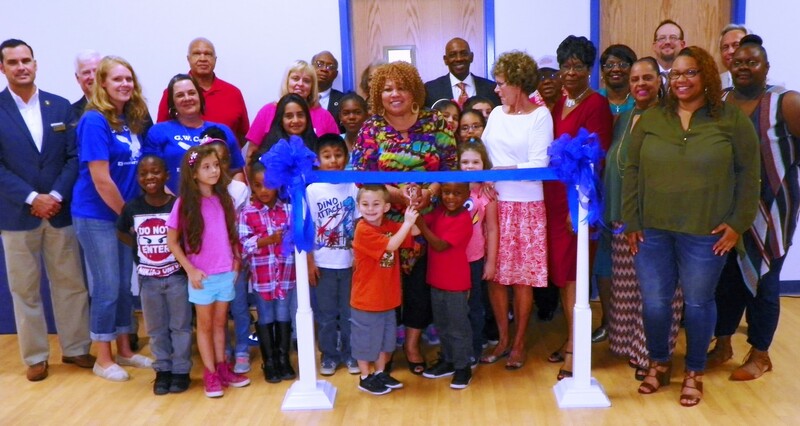 All of the 225 students in the school were joined by the entire school staff, parents, friends and local officials in dedicating the new multipurpose room and participating in a ribbon-cutting ceremony. Marion Perry, a valuable and outstanding supporter of Carver Elementary, presented the plaque, which will hang in the new facility, commemorating the amazing contributions of Wright. She presented the plaque to Wright’s widow, Maresa, and their two daughters, Sabrina and Ashley. In making the presentation, Perry talked about Wright’s devotion to Carver Elementary School and all public schools in Vance County. She said they often shared conversations about the importance of education and their mutual passion for helping children. Principal David Westbrook told the audience that the handsome, wooden plaque, with a color photo of Wright, will be placed at the front entrance of the new multipurpose room. Several local dignitaries were on hand to offer comments of praise for Wright and his steadfast support of the school and local children. Those who spoke included: Gloria J. White, chairwoman of the Vance County Board of Education: Gordon Wilder, chairman of the Vance County Board of Commissioners; Henderson Mayor Eddie Ellington; John Barnes, president of the Henderson-Vance County Chamber of Commerce; and Dr. Anthony Jackson, superintendent of Vance County Schools. Students and teachers from the school assisted with the ribbon-cutting, which was led by White. Mrs. Wright and her daughters also participated as did all of the local officials in attendance. Image Information: Shown at the Henderson-Vance Chamber of Commerce ribbon cutting for Carver Elementary School are, Vance County School officials; Principal, staff and students for Carver Elementary School; Family members of former Vance County Commissioner Eddie Wright; Chamber of Commerce staff and local elected leaders.